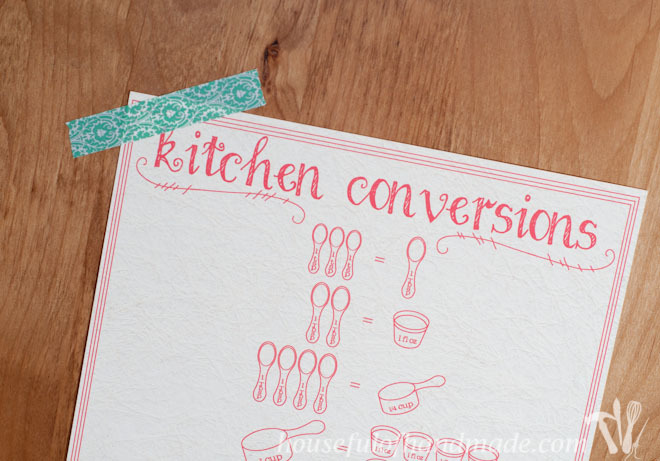 This printable kitchen conversion chart with hand drawn elements will make cooking fun & easy. I feel like I have been doing a lot of cooking lately! I’m not sure if it’s because the kids are home for breakfast, lunch and dinner or because I have lost my motivation and just want to enjoy summer, but I feel like I am in the kitchen all day. Now I do like to cook, but sometimes I like to do other things too 🙂 Like play around with Illustrator now that I have finally learned how to. So I decided to make my life a little easier in the kitchen (especially when creating new recipes) and strengthen my Illustrator skills at the same time today. 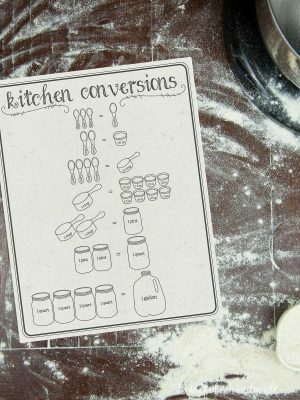 I have been needing a kitchen conversion chart to help me with the basic conversions I do all the time, so I made one! And I couldn’t be happier. I know there are a lot of options out there for printable kitchen conversion charts, I could have found a cute one on Pinterest, printed it out, and got on with my cooking. But I L.O.V.E. to do it myself (hence the reason I started this blog). And when I do it myself, I can get exactly what I want and I wanted just the basics conversions that I use all the time. For some reason, I always get 3 teaspoons per tablespoon and 4 tablespoons per 1/4 cup mixed up and try to do 4 teaspoons per tablespoon. Not sure why my brain always second guesses me with that one. But now I can quickly refer to my chart and keep myself from adding too much baking powder in my recipe. 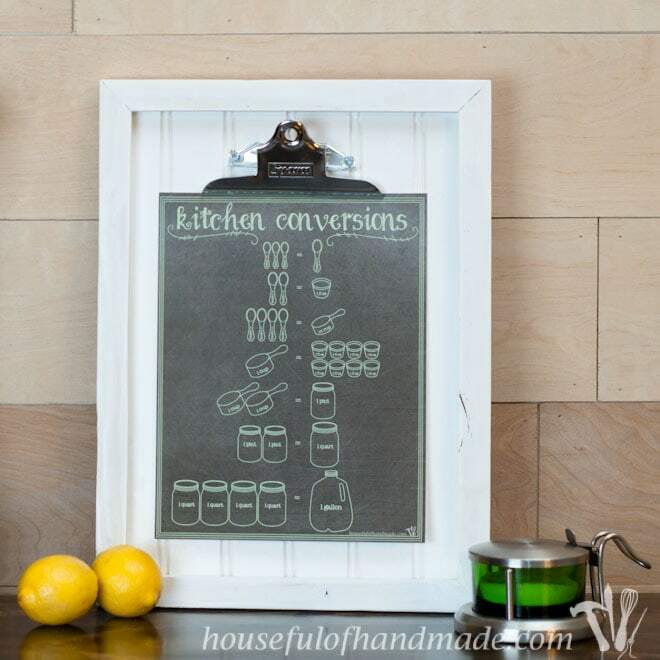 And since I am so happy with how it turned out, I decided to share my printable kitchen conversion chart. Don’t you just love printables?!? And since I know some people might not be as in love with the chalkboard look as me, I did 2 colors with a paper background instead! Lots of love for everyone! 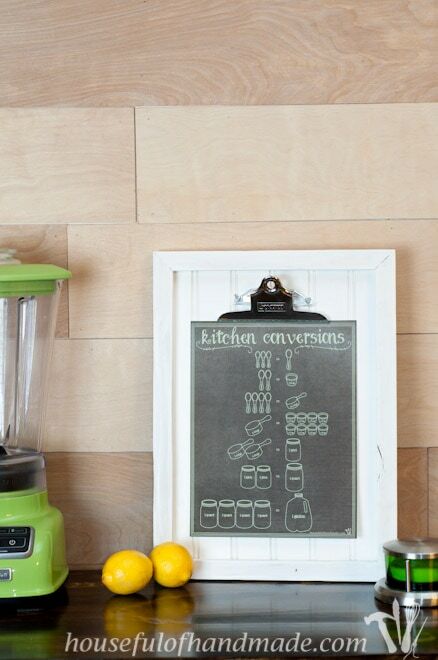 I used my clipboard picture frame to display the printable kitchen conversion chart. I think it’s pretty enough to sit out on the counter as decoration. But it also works just as nicely taped to the inside of a cupboard. Then you can always find it when you need it! 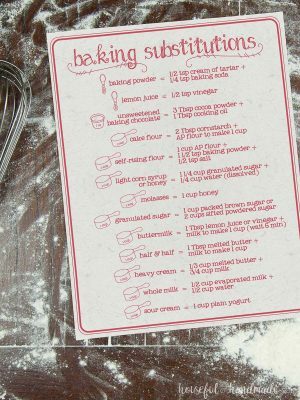 I love your baking substitutions and kitchen conversion charts!! Thanks for sharing them!! I was curious if you thought about doing a third chart? 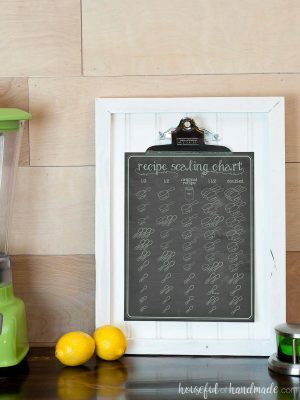 Or if you would be willing to share the chalkboard template? I would love to display them in 3 frames in my kitchen. Thanks again!! Thanks so much Laura! A third chart would be a fun idea, but what would be on it? I’ll put some thought into it and maybe work on something to go along with our kitchen remodel that will be happening in the next couple months! Thanks for responding!! What about a “Halving Conversions” chart (or something like that)? Here’s an example I saw about cutting a recipe in half. Just an idea that kind of goes along with your theme!! This is a great chart! Very cute! I LOVE this! I’m always having to use my phone to google conversions, so having it on display in my kitchen would make life so much easier. This printable is super cute, too! I pinned it so I can print it out and use it in my kitchen when I move in a few months. I love the idea of displaying it on a clipboard. Thanks Jenna! I am so glad you like them. I hope they can work in the new house! Thanks so much for featuring my kitchen charts 🙂 I love my clipboard display in the kitchen, now I need to make more because they are turning out to be super useful! This is so helpful, especially when I’m modifying recipes–either cutting them in half or doubling. Thank you for sharing this, Kati! 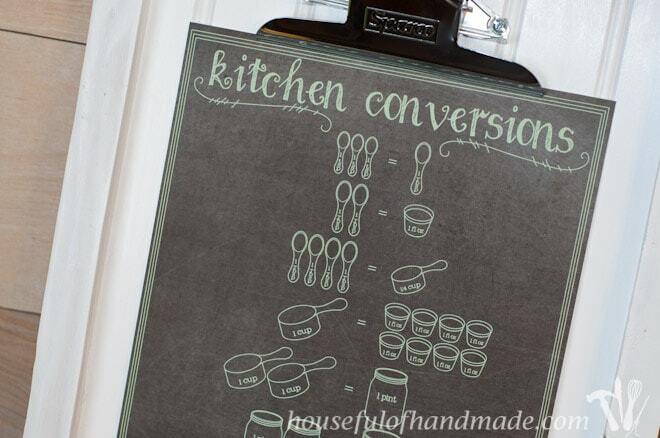 Im printing the chalkboard one to display in my kitchen a non-chalkboard for my cupboard. I love this! I can never remember all of the conversions when I’m baking. The chalkboard one is my favorite! Thanks for sharing at Merry Monday! This is going to be one of my features this week. 🙂 Hope to see you again Sunday night! Thanks so much Chelc! I’m glad to hear I am not the only seasoned cook that can’t remember conversions 🙂 So excited for the Feature! Thank you so much. This is an awesome graphic! What a great idea! It’s so handy to have something like this where you can easily access it. Love the chalkboard ones! This is so cute! I’m in the process of remodeling my whole kitchen and this is going to look great hanging on one of my new walls! Thank you for sharing! Thank you! I’m glad you like the design and jealous of your kitchen remodel! Hopefully I can do mine next year. These are so cute! 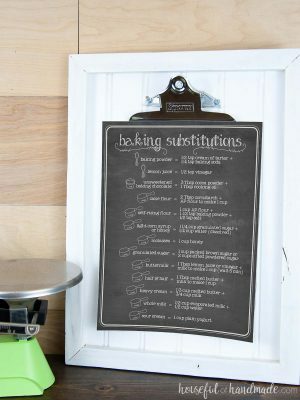 A great idea for the kitchen – I always have to look up things too! Thanks Cristina! I am always asking Siri on my phone for conversions, but when I have dirty fingers I don’t want to have to! These are adorable and would make an excellent companion gift for a bridal shower! Thanks for sharing these! Thanks Judith! I love your idea about using it as a companion to a bridal shower. Illustrator is easy once you learn the basics. I tried to figure it out so many times, but never got the hang of it until I took a class from Bonnie Christine on Creative Live. She makes Illustrator so easy! I would definitely recommend it 🙂 And you can find so many tutorials to learn new tricks once you have the basics down. 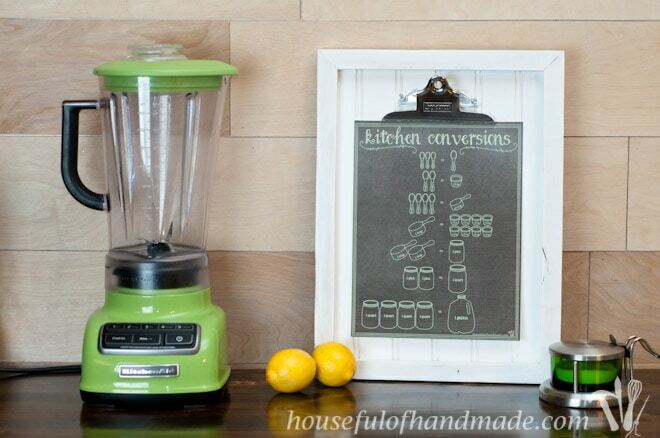 I love this, I have to have a chalkboard one. Free printable are the best. Thanks for sharing.